The EU will be "defeated" in Brexit negotiations unless it maintains absolute unity, European Council president Donald Tusk has said. The ex-Polish prime minister told the European Parliament the UK's departure was the EU's "toughest stress test" and it must not be divided at any costs. 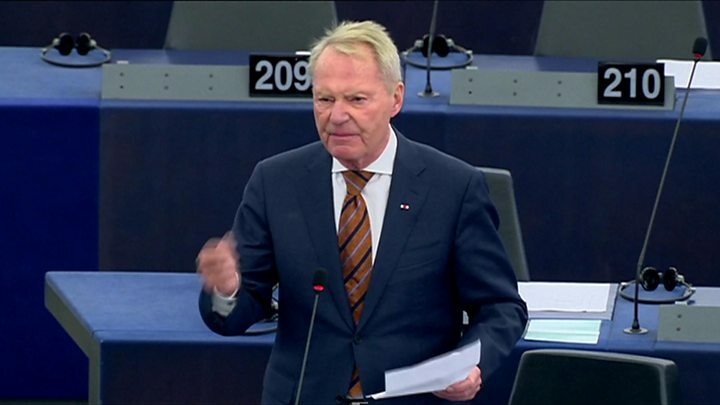 "If we fail it then the negotiations will end in our defeat," he told MEPs. But one German MEP said the EU's stance was "illogical, dangerous and unfair" and UKIP accused the EU of "extortion". The UK is due to leave the European Union at the end of March 2019 and until Mr Tusk's comments both sides have sought to avoid talking about victory, defeat and winners and losers in the negotiations. In an update following last week's Brussels summit where the Brexit process was discussed, Mr Tusk said he was "obsessed" with preserving the unity of the other 27 members. Article 50 of the EU's Lisbon Treaty allows the UK and the EU to negotiate an orderly withdrawal, a transition period and the shape of the future relationship within a two-year window. Mr Barnier plans to complete the withdrawal agreement by the autumn of 2018 so it can be ratified by the European Council and the European Parliament. So we could know the outlines of the future relationship by then. But under EU law, a trade deal would have to be signed when the UK became a so-called "third country" and it is this that would likely have to be ratified by Parliaments in the member states. 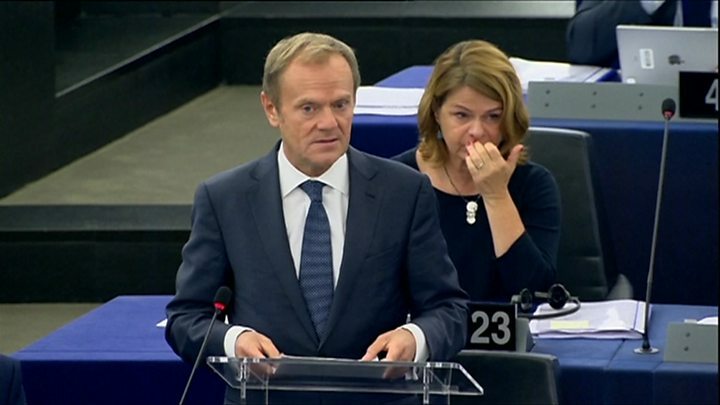 "We must keep our unity regardless of the direction of the talks," Mr Tusk said. "The EU will be able to rise to every scenario as long as we are not divided." He added: "It is in fact up to London how this will end: with a good deal, no deal or no Brexit. But in each of these scenarios we will protect our common interest only by being together." Responding to suggestions that the UK might choose to stop its withdrawal, a Downing Street spokesman said: "Brexit is not going to be reversed." So far, the Brexit negotiations have focused on the three "separation" issues of how much the UK has to pay to "settle its accounts" when it leaves, what happens to EU citizens in the UK and Britons elsewhere in the EU after Brexit, plus what happens with the Northern Ireland border. The EU says it will only move on to discuss the UK's future relations with the EU after "sufficient progress" has been made on these three issues. At last week's summit EU leaders decided more work was needed on these items before trade talks could begin with the UK - although the remaining 27 EU members have agreed to talk about the future options among themselves. The UK wants the second phase to start as soon as possible. On Monday, Theresa May told MPs she had a "degree of confidence" of making enough progress by December to begin trade talks. Meanwhile, the EU's chief negotiator Michel Barnier has suggested negotiations on a UK-EU trade deal could take three years if they begin in December. He told the Belgian newspaper L'Echo that the process would not be "without risks" because national parliaments in all the 27 remaining states would "have to give their approval" to any deal. A spokesman for Mr Barnier confirmed the remarks but stressed anything was possible and it was not a definitive statement that a deal would be done by December 2020. Speaking in Tuesday's debate, Conservative MEP Syed Kamall, who heads the European Conservatives and Reformists Group, called for more pragmatism and less idealism from the EU in their approach to the talks. "There needs to be an understanding from the EU 27 where the British people are coming from," he said. And Hans-Olaf Henkel, a German MEP from the Conservatives and Reformists Group in the European Parliament, urged Mr Tusk and European Commission President Jean-Claude Juncker to demonstrate more of the "British values of fairness" asking "whether you would agree a price on something you don't know or what you buy for". For UKIP, MEP Ray Finch warned that the UK would "remain subservient to the EU legally and financially" if talks continued on their current trajectory. Referring to demands for the UK to pay a so-called divorce settlement, he said: "This extortion will poison UK and EU relations for years to come," adding that the two sides should "shake hands and walk away" now.